Calculator` is the best calculator for your iPad. It provides all scientific and arithmetic functions. All operations like factorial, exponential, divisions, root, power and logarithm are supported. Including trigonometric functions like sin, arcsin, cos, arches, tangent, and more. The expression view allows you to keep track of the calculations and the history overview shows your past calculations. Advanced features like the scientific calculator are just a swipe away. You will never lose track of your numbers anymore. 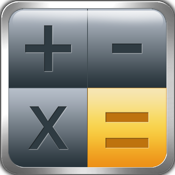 - Scientific and Basic calculator in Landscape and Portrait mode. - Expression History, live as you type! - Advanced Multi-Tasking support so you will never lose your calculations while changing to another application.